So going through and cleaning out my bathroom I have been doing major purges. I got storage containers to organize my bathroom medicine cabinet (the closet set into the wall behind the mirror) and have purged all my samples and haircare and beauty that I will not use, restocked on basics that I DID need, and am now attempting to go through and use up what I have. In the process I purged all my silicone containing conditioners and that left me with NO conditioner. None of it. I called Molton Brown up and found out my beloved indian cres conditioner has silicone in it, and so does every single other conditioner that they sell. So that was a bust. I went to Shoppers Drug Mart though, and it turned out really well. The first thing I got was the Curl It Baby! conditioner for curly hair. I have usually found that curly hair conditioners are terrible for me. They tend to be lighter and thinner (my guess is the need to prevent anything from weighing down the curls) but it translates into NOT very moisturizing and VERY runny conditioners. But I have been impressed with Gosh products in general (just finished an AMAZING hand creme from them. Seriously the first hand creme I have used up in the last few years!) and figured it was worth a shot. First is this: its silicone free. it smells like shampoo. I know that sounds like a really really weird thing to say but let me see if I can make any sense. You know how some shampoos or conditioners smell like fruits, or coconuts, or vanilla, or chemically? This one smells like generic old clean shampoo. That generic scent that as a kid most drugstore shampoos smelled like? Please SOMEONE leave me a comment here and tell me you know what I mean and that I am making sense to someone! It is thinner than many conditioners I tend to gravitate too but not in a bad way. You know how some conditioners when you try to work them through your hair you end up with a blob or too on the shower floor? No? Just me? Ok. Well this one spread very easily through the hair easily and effortlessly coating all the hair without being runny and running/dripping off the hair. I naturally tend to be drawn to thicker conditioners. I want it to REALLY coat the hair and REALLY moisturize. This one really does without the weight and I notice a difference. Yet at the same time, even though its thinner, its thick enough to be really moisturizing and to stay in your hair until you rinse it out. It washed out very easily without leaving a residue. 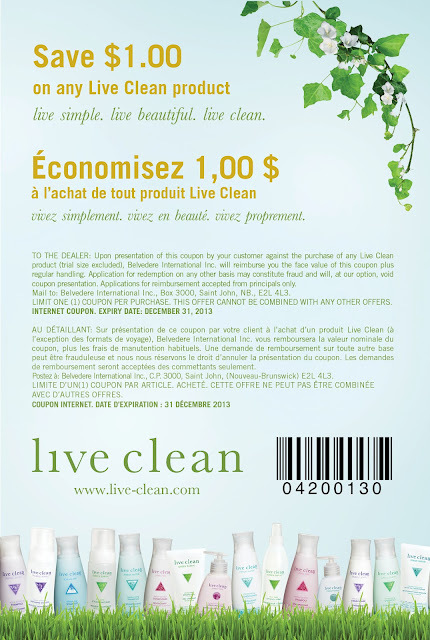 It is ONLY available at Shoppers Drug Mart/PharmaPrix and not at all stores making it possibly a bit hard to find. While I put the fact that it was at the $10 mark as a pro, its still not a super cheap conditioner and as such will put that in the con category as well. I really cant think of anything else that needs to be said about it. Overall, I really really like it and really recommend it! 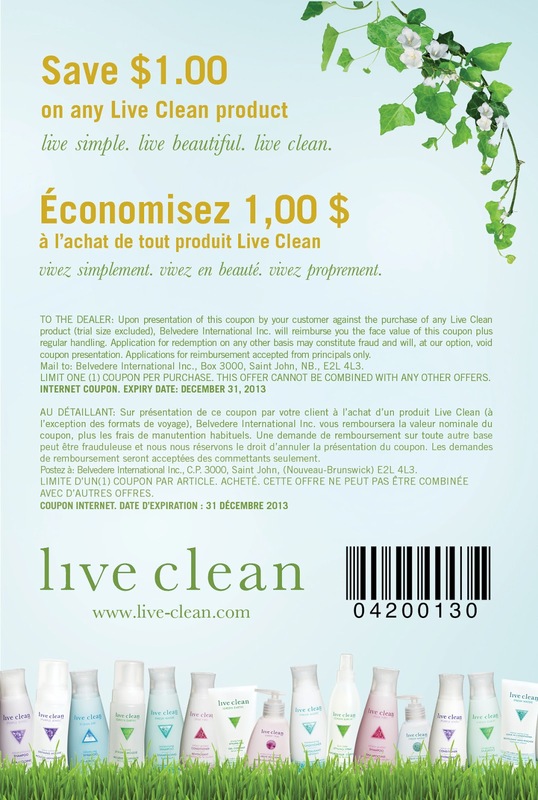 I also got these two live clean products. A conditioner (that came with a really generous 10ml sample of a facial moisturizer by the same brand. I will look forward to trying it out. I just hate when samples that will last you 2-3 days come in packets like that that you can not seal or close up. The truth is I got these two for three reasons. I went back to get a few more today as I got $1 off coupon (and for 1000 bonus optimum points, why not?) but they are back up to 7.99. They are however still on optimum promotion so if you pick up a couple you still get the bonus points. Liveclean is awesome! I have one of their conditioners, I don't use it often but I loove the smell. when the hair products smell nice is the best thing! Just bought a heat treatment spray that turned out to have silicone so it got trashed. But it would have been trashed anyways because it literally smelled like toilet bowl/bathroom cleaner! I learned my lesson 3 weeks ago and will no longer buy a hair product without smelling it first!